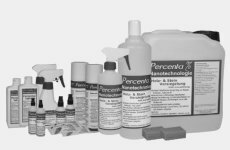 With 'Percenta Nano Chrome & Stainless Steel Sealant' protects surfaces from grease and bacteria. It can be applied on extractor fans, kitchen sinks, indoor and outdoor handrails, high quality V2A furniture etc. The invisible sealant provides a long lasting protection. 'Percenta Nano Chrome & Stainless Steel Sealant' is suitable for all untreated sorts of stainless steel, for example stainless steel fronts, handrails, covers, panels, door handles etc. It is also recommended for restaurants or kitchens, bars made of stainless steel or copper and panels in sanitary buildings. 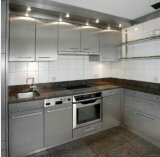 Stainless steel kitchens can be difficult to clean. First contaminants, such as grease, fingerprints and food stains have to be removed. Afterwards the surfaces need to be polished. This can be simplified with our 'Nano Chrome & Stainless Steel Sealant'. After just one application, surfaces will be protected against all sorts of contaminants. Almost everything can simply be removed with a damp cloth. It saves time and money on chemical and aggressive cleaning agents. Dirt, oil and fingerprints will be removable without any effort, as they only stay on the top of the surface. Furniture made of stainless steel attracts dirt and is hard to clean. With our 'Nano Chrome & Stainless Steel Sealant', every piece of furniture can be sealed to simplify the cleaning. 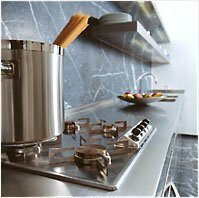 Small objects made of stainless steel also have to be cleaned regularly. To save time, especially on small, hard to clean pieces, we recommend a 'Nano Chrome & Stainless Steel Sealant'. Every musician likes his/her instruments and equipment to always look like new. With our 'Nano Chrome and Stainless Steel Sealant' every instrument and piece of equipment can be protected against dirt and scratches without changing the original appearance.